The Circuit Playground board from Adafruit is an electronics board with an Arduino microprocessor which has lots of features built into the board so that it can easily be used for prototyping, learning and simple custom maker projects. This is a great idea as it means you can get going straight away with a fun project, skipping some of the boring routine stuff. Circuit Playground is currently available in a early access developer edition for $19.99 and it's this version that we have been using. Adafruit also have an awesome kids series called Circuit Playground which teaches electronics to you children and shouldn't be confused with this product. I do lots of basic electronics projects for kids at hack days, with our local Maker Space, with Cubs, at school and with my own children. I'm always looking for good ways to be able to teach concepts and get kids doing useful stuff without lots of set up or high cost. The Circuit Playground caught my attention as a possible addition to my kit list. The Circuit Playground board is packed with features that make it brilliant for a first step towards using the Arduino Programming Environment. Arduino is widely used for writing code for microprocessors (mini computers than can control hardware components such as LEDs, sensors, motors and buzzers) so it's a useful skill to develop. 10 RGB LEDs (Neopixels.) These are incredibly bright! You'll want to turn the brightness down in your code or diffuse the light with a cover. OK I admit it, I'm a sucker for sparkly lights. Colour changing lights are a great way to get kids attention too. They can be used to create fun lighting effects or to give feedback. Mini speaker. This is just a tone buzzer that can play notes so you can play simple tunes or make sound effects. You always want to add sound to beginner projects so having this built in is a real plus. A movement sensor - the Circuit Playground can tell when it's in motion and report movement in 3 dimensions and detect freefall. This enables the Circuit Playground to be used as a controller or in a science experiment. Light, temperature and sound sensors - all very common in introductory electronics and maker projects. Having these built in is very handy. 8 input output pins for connecting additional hardware which can also be used as capacitative touch sensors. This enables MaKey MaKey style projects without the need for a ground connection. The board is also capable of acting as a HID (mouse / keyboard) device which provides some interesting possibilities. The Circuit Playground board can be programmed with the Arduino IDE and has a library which allows you to do cool things with the board without writing lots of low level detailed code. Using the Arduino IDE does require you to write C code but there are examples for the Circuit Playground and the environment makes it manageable for older kids and teens who are happy to write text-based code. The Firmata library also allows the Circuit Playground board to be controlled from Python, a popular beginner programming language. Ideally I'd like to be able to use the Circuit Playground board with a graphical tool to allow younger kids to program it. The Circuit Playground does have support for Arduino Firmata which exposes some of it's functionality in a generic manner. This means it can be used with some graphical tools in a limited way. I did manage to use the Circuit Playground with Scratch via the Scratch X Arduino extension but because the support is generic it's not ideal. Custom support would be much more intuitive and offer access to more features. There is a specific Circuit Playground Scratch X extension under development. It looks like there will be support for Circuit Playground in the Code.org App Lab in future, that will make the board much more accessible to a younger audience. The Circuit Playground library and examples definitely help to make the Circuit Playground easier to work with than other Arduinos that we've used. There's nothing too painful in the setup to use the IDE. But to be honest I'd rather have an experience like the BBC micro:bit where you just head to a website, plug in the device and get coding with simple graphical or text-based tools. Once you've got everything set up it's really quick to get new code written and onto the board and into a project. It is an early release development board but it's been pretty smooth to work with so far. Double tapping the reset button and then uploading a new sketch has been needed a few times. Adafruit have tutorials and several examples which can be used to explore the functionality of the Circuit Playground board. The Glowing Pokemon Go Team badge is a topical project that also uses 3D printing. We quickly moved on to making our own projects with the board using the tried and tested method of copying bits of code from example projects and editing them! My kids (aged 8 and 9) have done a bit of simple Arduino coding before with assistance. They definitely need help to create a project, but they can understand what's going on and make changes. Adafruit are an interesting open source hardware company led by the fantastic Limor Fried aka Lady Ada. We've previous written about their Circuit Playground series for young children. And one of our most popular posts was written after my kids wanted to repeat one of the experiments they saw in a Circuit Playground episode. Fried appears in a weekly Ask an Engineer show on YouTube where she answers questions about engineering. There is also an excellent series of Maker to Market videos that explains how the Circuit Playground was conceived, designed and taken to market in great detail. Excellent training material for future engineers. "The Adafruit Circuit Playground board is fab for maker families and Arduino beginners. With graphical drag and drop coding the board will be able to reach an even younger audience in future." 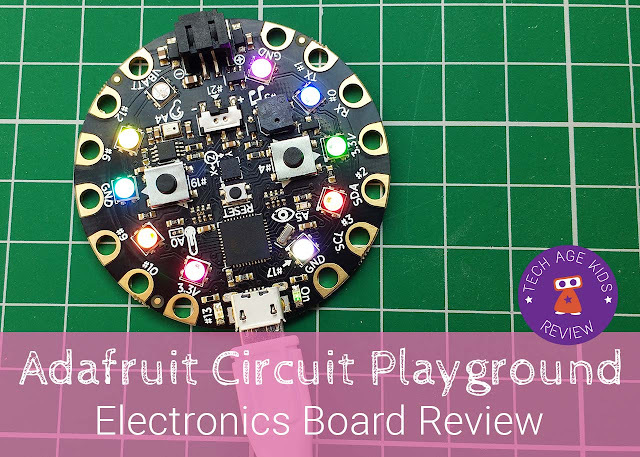 The Adafruit Circuit Playground is a fab board for beginners whether they are adults, teens or experienced older kids. It's also good for using with older kids and tweens with parental support. I'd love to see support for graphical drag and drop coding for this board (and it looks likely that this will happen.) The electronics concepts are very accessible to children who wouldn't be able to cope with the Arduino coding environment yet. I can see the Circuit Playground being a goto board for getting family project ideas up and running quickly. The Circuit Playground is currently out of stock on the Adafruit website, but you can sign up to be notified when it's back. Digi-key and Mouser currently have stock. 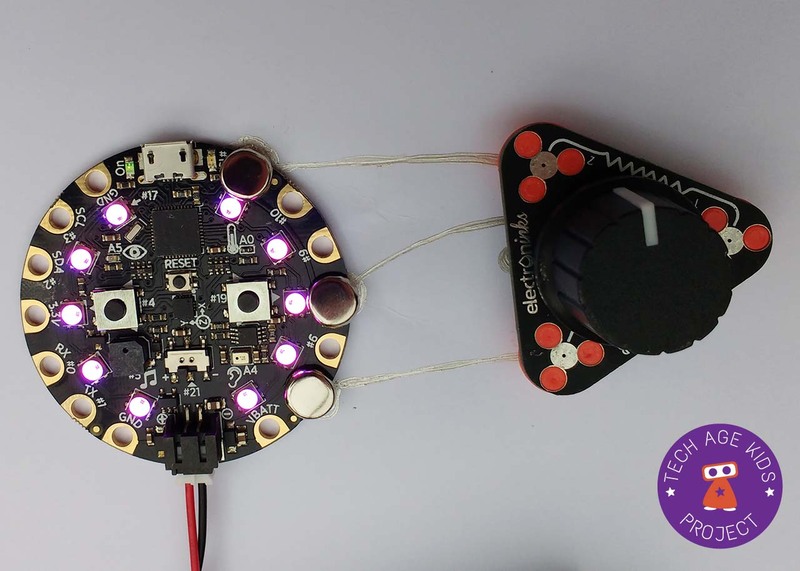 With the kit you'll be working in Scratch with the Circuit Playground in the web browser in just a few minutes, which makes it just as simple to use as the micro:bit. There are also instructions on the Embedit website to install this Scratch firmware for people who already have a Circuit Playground. And of course everything is open source.